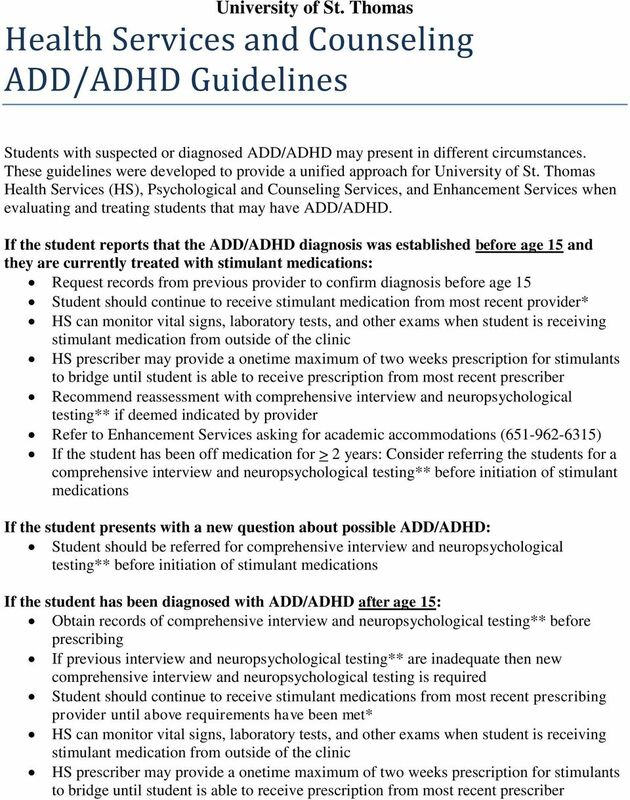 Download "University of St. Thomas Health Services and Counseling ADD/ADHD Guidelines"
2 If the student has additional mental health diagnoses: Mental health prescriptions should come from one clinic location. Prescriptions: Stimulant prescriptions must be printed / written out on secure prescription paper/pad. Students should be informed that stimulants cannot be called or faxed to pharmacies. One pharmacy is to be established as the pharmacy for stimulant prescriptions for each student Students should be instructed to only carry the amount of stimulant medication required for the day and to keep prescriptions in a safe place where others are not able to access them. Students should be informed that, in general, lost or stolen prescriptions will not be replaced. However, prescribers may consider a limited replacement refill in special circumstances (e.g. 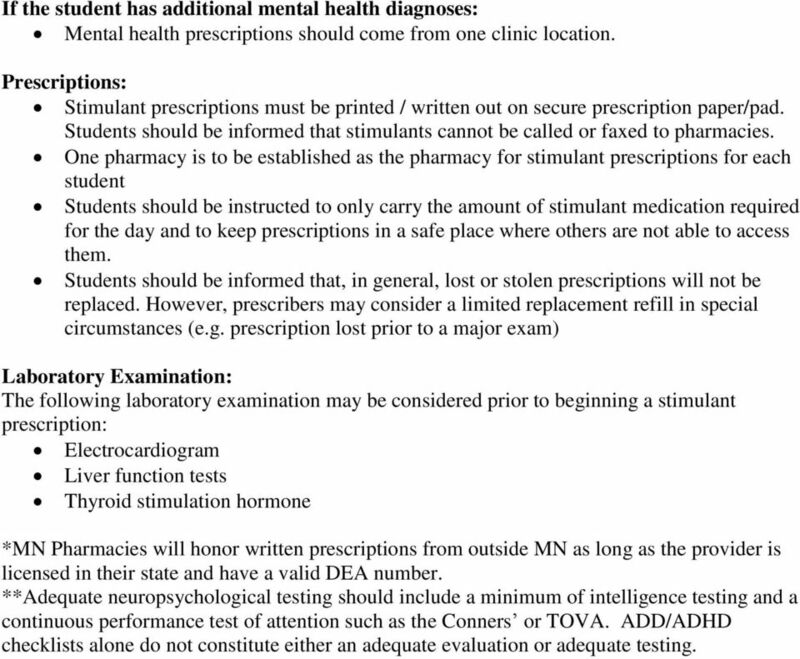 prescription lost prior to a major exam) Laboratory Examination: The following laboratory examination may be considered prior to beginning a stimulant prescription: Electrocardiogram Liver function tests Thyroid stimulation hormone *MN Pharmacies will honor written prescriptions from outside MN as long as the provider is licensed in their state and have a valid DEA number. 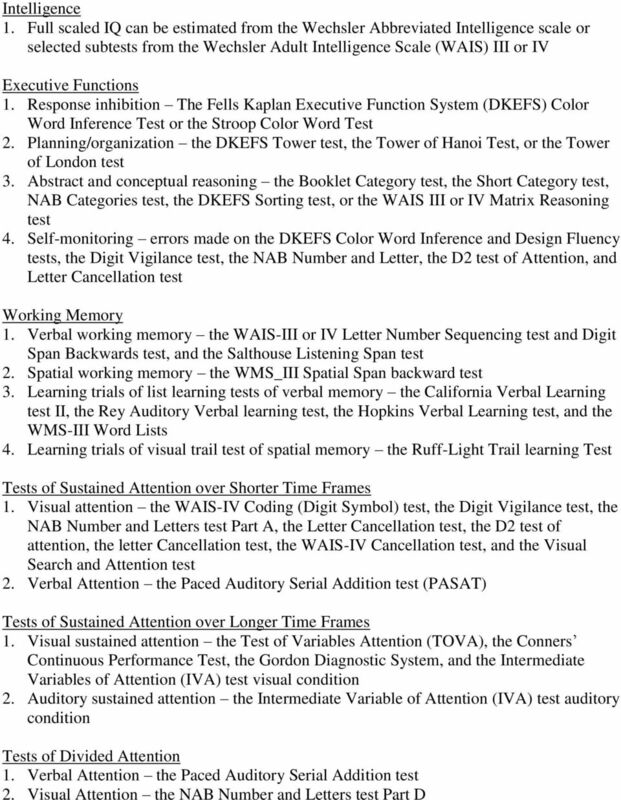 **Adequate neuropsychological testing should include a minimum of intelligence testing and a continuous performance test of attention such as the Conners or TOVA. 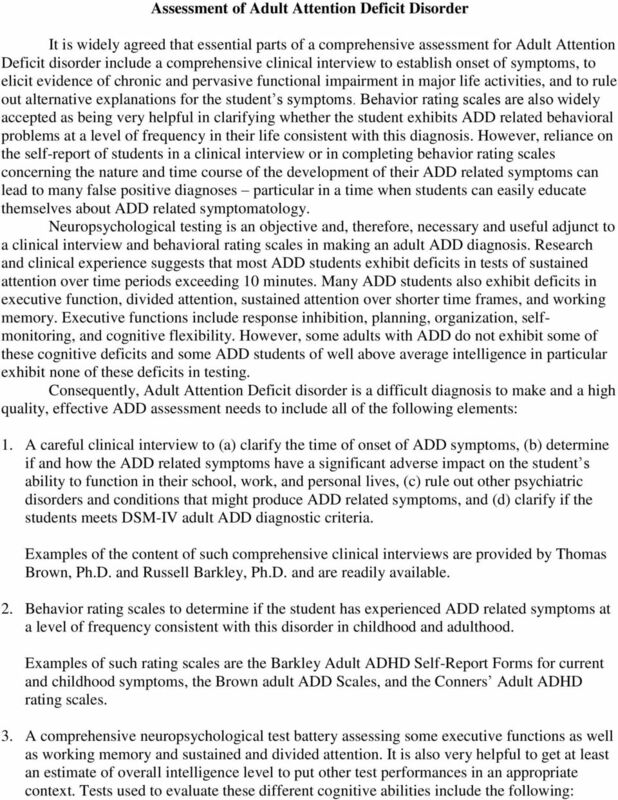 ADD/ADHD checklists alone do not constitute either an adequate evaluation or adequate testing. 5 Frequently Asked Questions about Attention Deficit Disorder Assessment and Treatment It is the policy of Health Services that students requesting treatment for attention deficit disorder have completed a comprehensive clinical evaluation that includes neuropsychological testing or provide documentation of diagnosis and treatment in childhood prior to initiating or continuing treatment. This handout addresses many of the common questions that students have about this process. If you still have questions about how to arrange for evaluation and treatment of ADD please feel free to Enhancement Services to discuss more details about your ADD concerns. What is a comprehensive ADD evaluation? A comprehensive ADD evaluation is a neuropsychological evaluation generally performed by a Ph.D. level licensed psychologist. After an initial interview (typically about 60 minutes in length), the psychologist decides upon a series of tests appropriate to further investigate the symptoms that you are experiencing. The evaluation may be done over a series of days i.e.. the initial interview scheduled on one day, one block of testing 3-4 hours done on another day, and a second block of testing of 3-4 hours done on another day. A final meeting may be provided by some psychologists to review the results of the evaluation with you. An evaluation may also be completed in one day. For those evaluations, an initial interview is performed, and a block of 5 hours of more of testing may be completed on the same day. I had an ADD evaluation done in my hometown. Can I submit that? You are welcome to submit previous testing. However, it is common for these evaluations to fall short of the standards our psychiatry staff requires. Conversational interviews with your physician and/or taking a pencil/paper checklist do not meet the requirements of a comprehensive ADD evaluation. If your previous evaluation does not meet our criteria, you will be notified, and you may be referred to psychologists in the metro area who perform comprehensive ADD assessment. I ve been on ADD medication for several years now. I need a prescription to continue my medications as soon as possible. 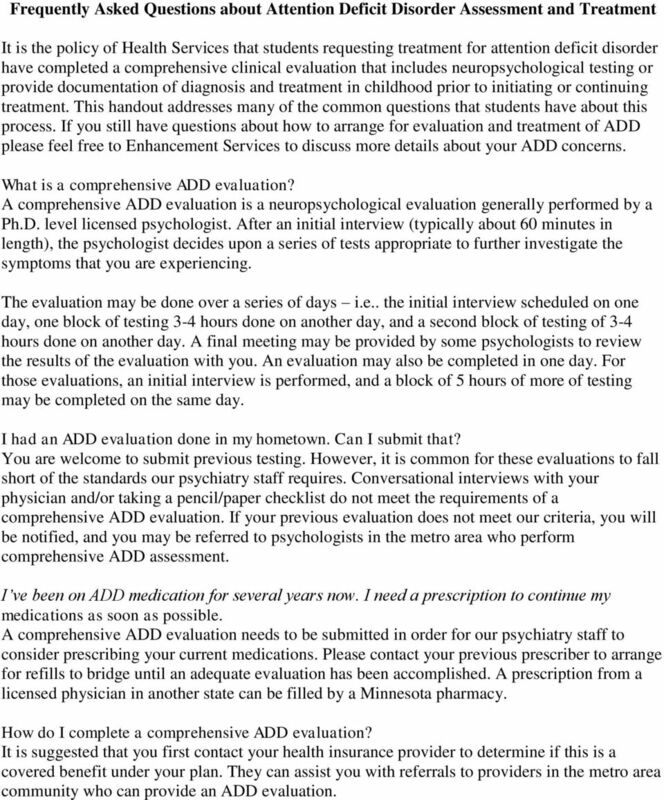 A comprehensive ADD evaluation needs to be submitted in order for our psychiatry staff to consider prescribing your current medications. Please contact your previous prescriber to arrange for refills to bridge until an adequate evaluation has been accomplished. A prescription from a licensed physician in another state can be filled by a Minnesota pharmacy. How do I complete a comprehensive ADD evaluation? It is suggested that you first contact your health insurance provider to determine if this is a covered benefit under your plan. They can assist you with referrals to providers in the metro area community who can provide an ADD evaluation. 6 Who are local resources that can provide ADD evaluation? 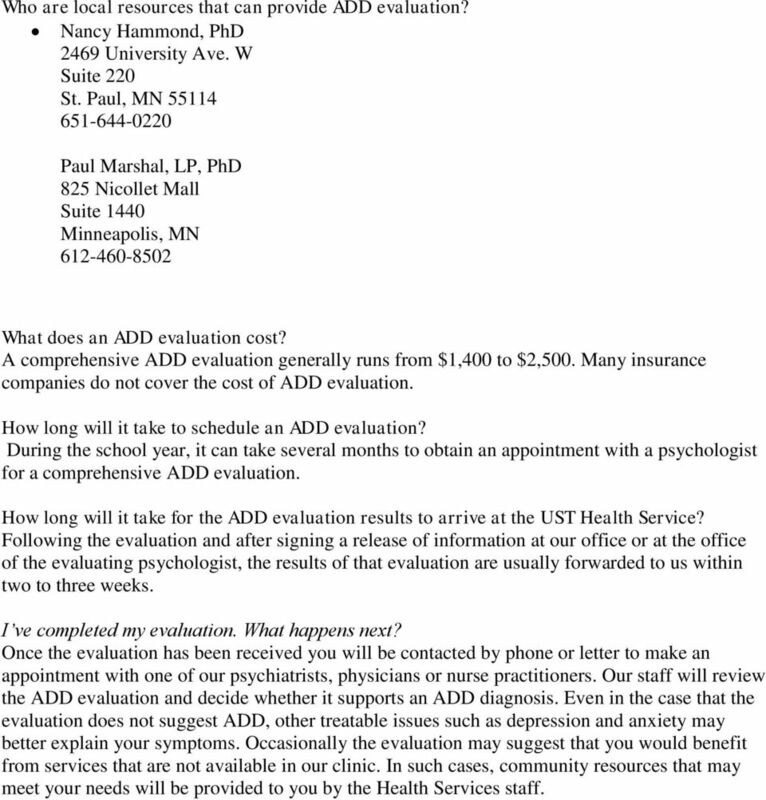 Nancy Hammond, PhD 2469 University Ave. W Suite 220 St. Paul, MN Paul Marshal, LP, PhD 825 Nicollet Mall Suite 1440 Minneapolis, MN What does an ADD evaluation cost? A comprehensive ADD evaluation generally runs from $1,400 to $2,500. Many insurance companies do not cover the cost of ADD evaluation. How long will it take to schedule an ADD evaluation? During the school year, it can take several months to obtain an appointment with a psychologist for a comprehensive ADD evaluation. How long will it take for the ADD evaluation results to arrive at the UST Health Service? Following the evaluation and after signing a release of information at our office or at the office of the evaluating psychologist, the results of that evaluation are usually forwarded to us within two to three weeks. I ve completed my evaluation. What happens next? Once the evaluation has been received you will be contacted by phone or letter to make an appointment with one of our psychiatrists, physicians or nurse practitioners. Our staff will review the ADD evaluation and decide whether it supports an ADD diagnosis. Even in the case that the evaluation does not suggest ADD, other treatable issues such as depression and anxiety may better explain your symptoms. Occasionally the evaluation may suggest that you would benefit from services that are not available in our clinic. In such cases, community resources that may meet your needs will be provided to you by the Health Services staff. Learning Disability Documentation Instructions Updated December, 2015 The Office of Accessibility Services establishes academic and/or housing accommodations for students with a documented disability. Steps to getting a diagnosis: Finding out if it s Alzheimer s Disease. CASE STUDY. The following case study contains all the components described in. Chapter 2 The Assessment Process - Psychoeducational Assessment. Diagnosis of Alzheimer s Disease At the age of 58, Matthew Blair began to have difficulty reading, speaking, and performing daily tasks at work. His wife, Isabel, was convinced that he had Alzheimer s.
Student, please sign in the box below giving our health-care provider authorization to release information to OSA. Anne Cecelia Chodzko, Ph.D., P.C. INTRODUCTION Attention-deficit/hyperactivity disorder (ADHD) is one of the most common chronic childhood disorders. Current estimates indicate that 4% to 12% of all school-aged children may be affected. The Scoop on Understanding Psych Testing: What do all those numbers really mean??? DSM-5. Presented by CCESC School Psychologist Interns: Kayla Dodson, M.Ed. Ellen Doll, M.S. Rich Marsicano, Ph.D. Elaine Wahl, Ph.D.
Concussion Vital Signs Peter C. Entwistle Ph.D. Charles Shinaver Ph.D. Pearson Webinar Football season is almost here and so is baseline testing for your athletes. This webinar will provide a "how to"